Saturday night after supper we had a chance to get pictures of all of us with the sculptures, last chance for that as Paul is leaving at 7:30am tommorrow. This is Carlos' piece, "Prelude". "Desire To Be", Gerard Motondi. All people desire to be something which they are not, some in society will look up to leaders and desire to have what they have achieved while some who have achieved in leadership or business will look at those that lead simpler lives and covet their lifestyle.........we all desire something other than what we have or are. 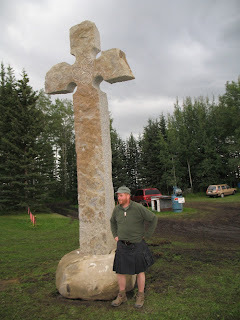 Paul realized another incredible Celtic cross. So many people who came out over the last year and marveled at the cross will have another to appreciate with the new cross at the park. This one is slightly taller than "Ancient Cultures" from last year, as large as manhy of the High Crosses in Ireland. Chander's sculpture is a temple. He says that in India there are 100's of these temples, that even a small town may have several of them. In the morning people go there to pray and pur water on the bells, they are nondenominational, Budhists, Hindus and Christians are all welcome to pray there. The title conveys this mutual respect idea perfectly, "Gates to Heaven, Anybody can go"
It was so much fun and amazing things happened in the creation of "Gates to Heaven, Anybody can go". The sculpture changed dramatically, many challenges and coincidences presented themselves that influenced the result. 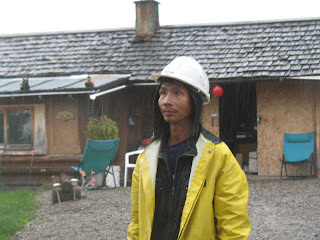 Chander had already carved one bell which wieghs approx 300lbs when he decided to switch to welded steel bells. Lots of other neat stuff that wasn't planned was incorporated in the final piece, this temple was a piece that evolved as it was being created. 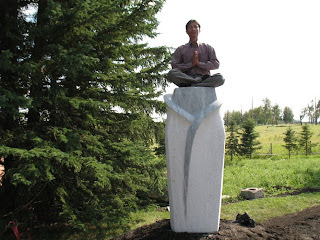 "Spring" is such a serene and beautiful sculpture, especially with the artist meditating on top of it after being placed. The form of a young lady ready to bloom like a flower in the spring, in white and blue marble. The base is the shape of Viet Nam and the sculpture is placed right where Hanoi is. I see a message in this creative base although Chien never mentioned it. Viet Nam is also a flower that is ready to bloom. It is a beautiful country with such warm hearted people, tourism is increasing yearly. Monday, Aug 17 Gerard left for Kenya, he will only have 2 weeks at home before going to Korea for another symposium there. Everyone that is still here went down to see him off. 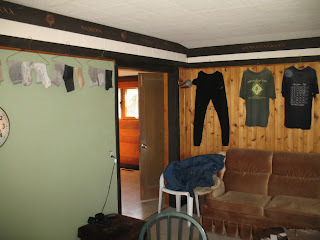 It is closing day, yesterday was a rainy and cold one so instead of the laundry hanging on the fence it is all over the house, looks like we can expect nice weather today. That's great, last year was cold and rainy on closing day. Our county reeve, Al Kenmere, attended the closing ceremony along with the councilor for our area Kathy Blaine. Both said flattering things about the symposium and the resulting artworks. It is great to have this local support. Over 7% of the attendants this year were from our nearest town, Sundre! We hope to see that number increase in the future as well as attracting even more people from outside of our area. 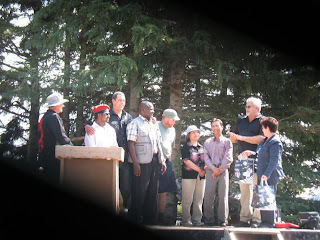 The City of Calgary named all the participants Honorary Citizens of Calgary, Calgary Tourism performed a white hat ceremony, Travel Alberta gave gifts, Up Towne Olds sponsored a reception......several communities in our area (Western Canada) are interested in holding a symposium of their own. This is really exciting for us, this kind of interest and recognition satisfies several of our objectives and confirms to us there is potential for the program to expand beyond Bergen. It is actually a few years earlier than we projected for this kind of enthusiasm to develop.........art is a powerful commodity. 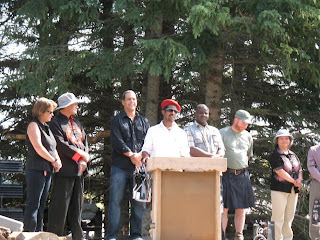 Chander Parkash sposke on behalf of the sculptors at the closing, expressing that the stone was good, the working atmosphere a pile of fun.........that this year's symposium was a big success from the point of view of the artists. Everyone had fun "exploring" their work and others. 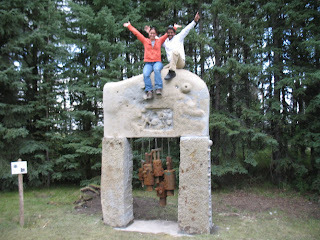 My daughter Jessica and Chander his sculpture and gave a celebratory wave. This sculpture is a temple, similar to 1000's across India. People go each morning to pray and pour water over the bells. I don't think they are devoted to a particular religion, regardless of your faith you can pray here. The title " Gates to Heaven, Anybody Can Go" is perfect, in itself a wonderful message. Bergen Community Association; the event is in Bergen and this group is involved in contributing to the community in many ways. 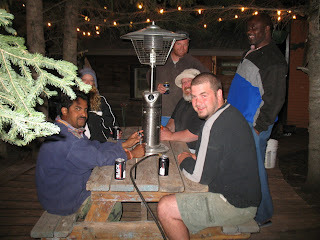 Sundre Paddlers; We scheduled a raft trip on the Red Deer River three times, each time the weather wasn't cooperative. The Sundre Paddlers were going to host this trip. It is always a challenge to maintain and replace equipment etc, over the years many many people have learned to enjoy the river safely through this club. Sundre boasts a long list of competative paddlers who have had success' provincially, nationaly and internationally and were introduced to the sport through this club. 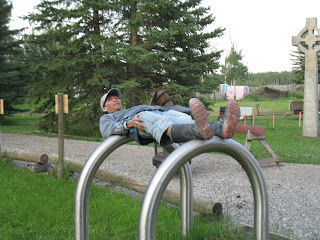 Sundre Pioneer Museum; Sundre has a first class museum, it is a focal point for the energies of many local residents. The museum is something that should be accessable to the public, funding to allow for that is constantly an issue. Sundre Community Van; The Sundre van came out several times with groups of seniors and shutins. 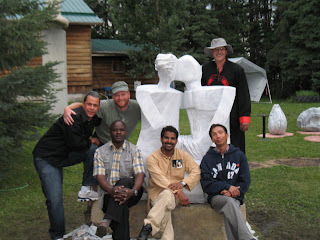 We really enjoyed having them come, the sculptors took time to meet and speak with them. This is a great service to have in our community and we look forward to seeing them on site again next year. Orphanage in India; That the participants came from around the globe for such a short period of time demonstrates that we live in a global community now. In some of the countries where our guests came from challenges in the day to day lives of some people are insurmountable. Although it isn't such a large amount, the money that we sent with Chander to donate to an orphanage in India will likely make more of a difference than the other four shares above combined. The remaining 40% will help us to hold another symposium in our region in the future. 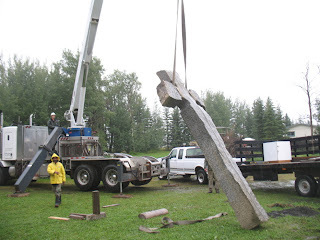 Paul's cross was the first piece to be loaded from the site, it is a cold and rainy day but the work has to get done. We're hoping for bettter weather tommorrow. The cross was stood on the grass first then picked straight up and placed over the locating pin in the base. 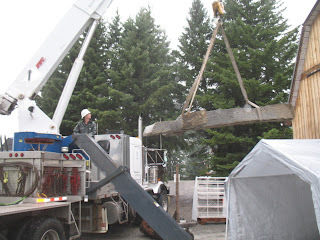 The weather got worse as the day went on, "Prelude" is hoisted onto the trailer. Kind of cool to see these huge sculptures flying through the air........that's what iron workers call it when they hoist beams etc. "Spring" and "Prelude" were loaded on the trailer at the same time. When a sculpture is placed it is pretty common to adjust the orientation more than a couple of times before the final OK. Sometimes we get it right the first time and then still move it at least a couple of times to be sure there isn't a better angle for it to face etc. Chien has a look at "Spring" from every angle before we move on to installing "Prelude"
I think this is the first picture of "Gates to Heaven, Anybody Can Go". Although one of the straps is still on a column the lintle was finally in place. After the bells are installed and the pad is covered with sod this sculpture will appear to be a 1000 years old already......coool! We did a lot of just running around taking pictures after the installations were finished. This old saw did a pile of work this year. As soon as we get slowed down and organized a little I will start work on building another one for next year. Since we use eratics rather than quarried stone there is a lot of prep work to do on the stones that isn't required if the material arrives cut to spec. To be sure that the location pins glued into the pad will slide right up into the bottom of the columns the receiving holes have to be drilled perfectly straight. Chander watches that the bit is going in parallel to a line scribed on the side while I watch that it stays straight left to right as we drill the hole. Paul is texturing the feather that runs all the way up his cross, it is the first in the work area so we will move it first in the morning. The big crane that is coming can't get past it without moving it. We set Chander's columns on the pad to be sure they would sit plumb and mark the pad for the position of the locating pins. Chander is drilling the hole for the righthand column. Both columns will be in place and ready for the big crane to set the lintel on tommorrow morning. 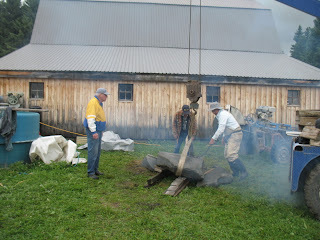 We also placed Stephen Yettaw's sculpture today, this sandstone cutoff is the base. 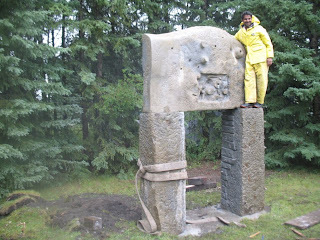 After setting the columns Chander cut the tops so that the lintel would sit perfectly on top. Most of the guys worked until 10 or 11 tonite. The realization that there is only one working day left is keeping everyone at their work. It drizzled all evening as well, the forecast for tomorrow looks bleak too. Guess we'll light the woodstove in the house (we had to dig up the propane line for the furnace to pour Chander's pad) and the one in the barn again tomorrow. It is really nice to slip into the gallery and warm up around the wood stove. Final check with bar to verify that the tops of the columns are on the same plane, it is completely dark now and pretty chilly. The crane comes at 8am for the installations. On Tuesday we placed all of the bases, this one is Gerard's for "Desire to Be". Volunteer from Bearberry, and artist, Danny Joe Jones was there most of the afternoon and helped out with chains and blocking etc that makes this kind of work a 3 man job with Old Blue. 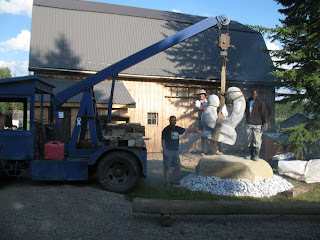 On Wednesday Desire to be was the first sculpture to be placed on it's base. Gerard will spend time on Thursday working on small details for the final installation. Paul, Gerard and Mark Stutiet, Bieseker sculptor, discuss what will be done to match the base and the sculpture for the final installation. A few options are available, Gerard decided to sleep on it and make a decision Thursday morning. We also placed Chien's base on Wednesday. Thursday Mark, Steven Turner and I used about 3 cu meters of soil to create an artistic element to the base which Chien designed. No picture right now but it is really beautiful and interesting. I can't wait to see "Spring" installed.....and all of the others. 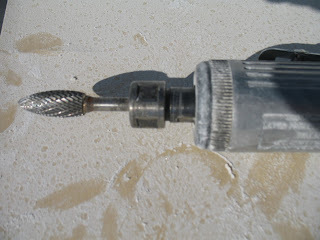 There have been several pictures of the big drills, saw etc. Details are done with chisel and hammer, and specialized tools like this one. A straight air powered die grinder with a carbide burr. Many shapes of burrs are used to make recesses or to shape some of the outside edges etc. 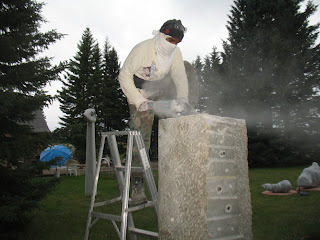 Really, what ever works is the rule of thumb for working stone. We build our own chisels on site , I'll try to gather some up and get a picture of them today. At the end of the day we sat on the deck with the heater on. It was a little chilly for this time of year, hoping for nice weather again tommorrow. Chien takes his turn cooking breakfast. Bergen roots is a grassroots (created and produced by the artists themselves) event. Without the volunteers and sponsors neccesary to provide things like prepared breakfasts, laundry service, internet access etc. 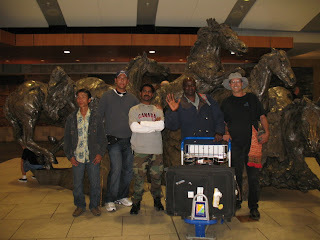 the sculptors are kicking in their help where needed. 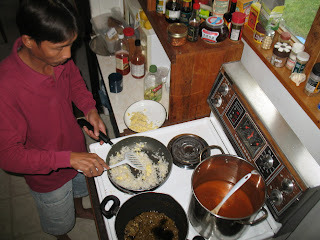 It has worked out great as everyone is taking turns making breakfast and even lunches and suppers some days. We are being treated to international quisine and having a lot of fun, sometimes there are dirty dishes in the sink and crumbs on the table when everybody gets to work after a meal but we get everything in order somehow before we sit down again. All of the artists are great cooks! 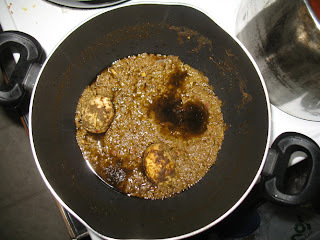 This is an egg dish that Chander prepared for supper last evening, first he boils the eggs then peels and fries them. Over rice and seasoned to taste with chili sauce it is delicious. We have been treated to other ethnic dishes from Ireland, Kenya, Viet Nam and Cuba. Cleaning your work area is an important task though mundane. 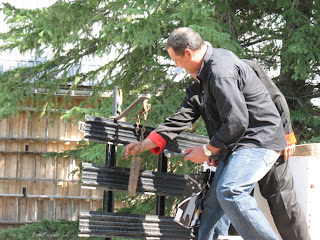 Here Chien is removing rubble from his work site, although the sculpture is on it's side it helps to "see" your work if keep your work area neat and tidy. We try to keep ahead of the need for the artists to do this work themselves but they make these chips so fast it is tough to do. Something to work toward in future events will be to provide a little more on site assistance for these kinds of jobs, allowing the artists to stay focused on their work when they get into the "creative zone"......everyone looks to be on schedule to complete on Thursday as planned and install the sculptures on Friday. Monday morning a group of seniors came out from Red Deer. They enjoyed the tour that we give to groups when we are able. The artists took the time to meet and speak with them. We've had community buses come out from Red Deer, Olds, Didsbury and Sundre. 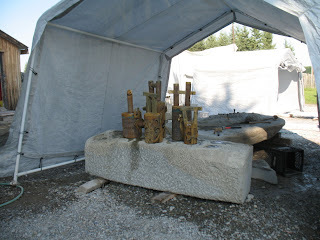 The site is set up so that they can drive the bus right onto the work site so that people who aren't able to get out can see the sculpting action up close. Lots of great comments, we love having them come out. 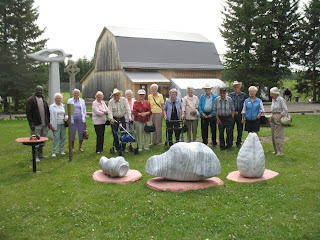 They enjoy seeing the work in progress, the gallery and the sculpture park. This group stayed about an hour, they were very nice people. I am around this kind of thing quite a lot now and sometimes forget that many people in our area have never seen stones being sculpted. 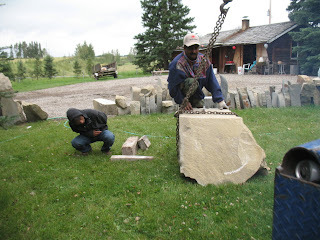 Although it is smaller than many other symposiums a similar atmosphere is created when the work starts, many visitors will stay for an hour watching as we prepare the big saw for a cut and then watch as the 3 foot diamond blade slices down into the stone. 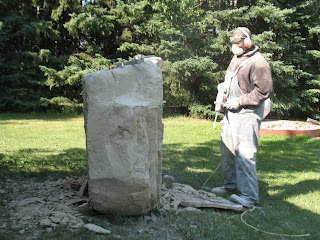 Mean while other artists may be turning their stones by hand or with the crane, drilling and cleaving, cutting and chiseling frets, grinding or polishing. It's great to see people come out and spend a couple of hours watching as the slow process of forming a stone into an artwork progresses. Putting videos on takes a lot longer than still pictures so I haven't done any so far. Yesterday every artist was working and I happened to be on the site, so I took a video of the work and decided to make a point of getting it on here today. I think it is universal that people enjoy watching as these stones are slowly shaped into the beautiful forms that will remain in our area for thousands of years into the future. 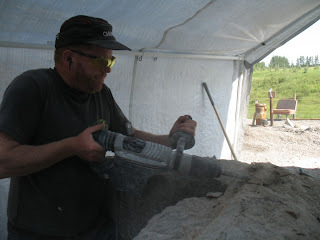 Paul is chiseling to the surface of his cross while volunteer from Calgary, Steve Turner, uses a bushing tool to texture the feather lower down. Chander is creating patina on his bells using heat and water, the heat creates blues and yellows and greens, water rusts the steel. 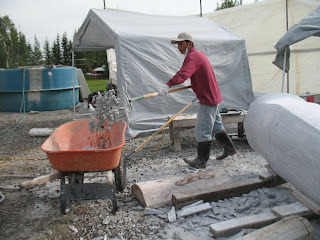 Chien is working with an angle grinder creating a surface on the back of "Spring". Gerard is polishing "Desire To Be" with a diamond impregnated disc and water for lubrication. Although I didn't catch Carlos in action he is also cutting with an angle grinder. 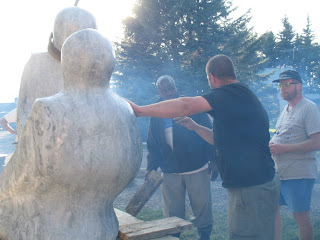 Today was another busy day, the guys were busy working on their sculptures or bases and Mark and I got things lined up to pour concrete for Chander and Paul. The weather was nice and there was a pretty good turn out of visitors. A lot of people from Calgary, Didsbury, Red Deer, Olds.......we are really pleased that they have the interest to travel here to experience the symposium. 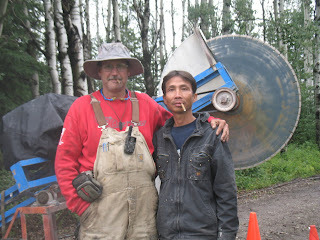 Only two of the bases will require concrete this year so we rented a small mixer, volunteers Mark Stuthiet (Beiseker) and I did the heavy work, Brad Callihoo (Edmonton) was in charge of the water. 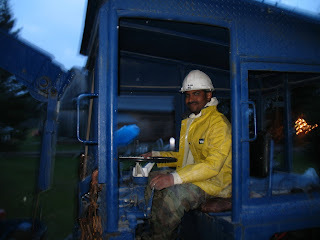 After losing his left leg in a motorcycle accident in 04 he has learned to assume management positions on our projects. 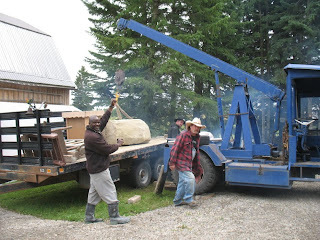 This stone weighs about 6000 lbs, it will be the base for Chien's piece, "Spring". With such a big footprint it won't need concrete under it. The ground is very firm, probably hasn't been disturbed for 30 years or more. 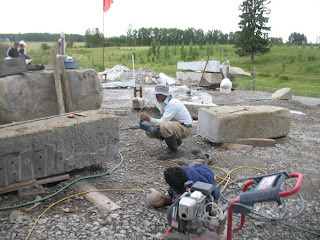 After placing his sculpture the base stone will be covered with soil and laid over with sod. Just goofing around! 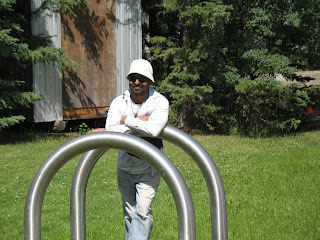 Chien almost fell off just before I took this picture, those 4" stainless steel hoops make nice rails for the bridge onto the lawn where last year's sculptures are installed. 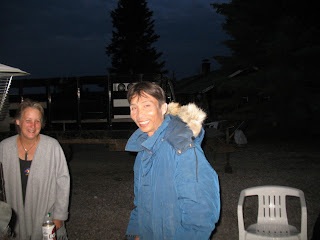 I remembered that Peerapong found my big down filled parka cozy last year so I dug it out for Chien, we all sat around the picnic table until about 11 enjoying the evening. Lightning to the south had Chander a little concerned after the storm last Sunday night. I don't think we'll see another one like that for years to come. Christine has been a trooper, along with cooking meals and washing clothes and everything else that needs to be done she is the curator of the art show. Our rule of thumb is that if an artist is interedsted enough to inquire and bring some work over we'd be glad to exhibit it. 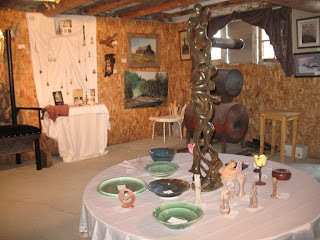 The barn becomes a beautiful exhibition space with Christine's inovations. Behind the curtain is an old car in the process of restoration. It's surprising how this space can transform for this month, it'll be back to a workshop a few days after the symposium is over. On site in an old rustic barn we have an art show that adds another interesting thing for folks to see when they come out. 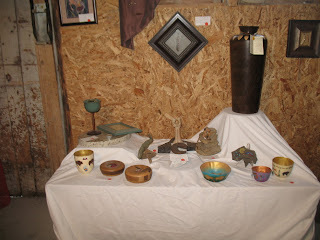 Paul, Gerard, Chander and Carlos brought small pieces with them to exhibit or offer for sale. 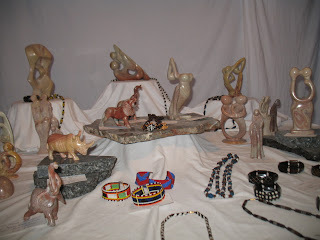 These works are Gerard's, made from Kisii Stone. 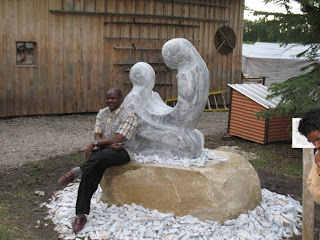 He lives in the village of Kisii, it is well known for this particular soapstone. It has viens of many colors running through it, cuts and polishes well. 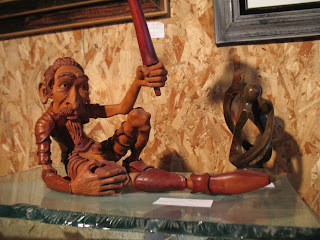 Another view in the art show, the tall wood sculpture in the centre is one of Carlos' works. Several local artists are also exhibiting work, paintings, pottery, woodwork, silver and goldsmithing........lots of interesting original work. 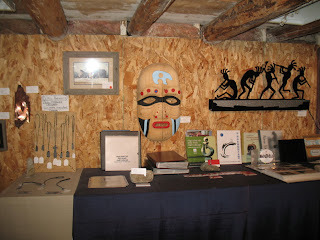 A mask by Bearberry artist Danny Joe Jones looks great along with a painting by Bill Holder of Longview and Kokopeli lamp by Christine Pinder. About half of the work is by locals from Edmonton to Kelowna. 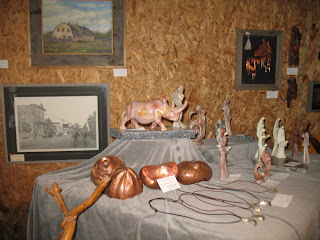 Barbra Bell from the art museum and gallery in Bearberry has several pieces in the show too. It's great to have them share their work with us and everyone that attends. More works by local artists, mache bowls decorated in a native theme by Karen and Rae Schzutalz of Nanton are beautiful. Painting on slate and an interesting assemblage by Leslie Huber of Bergen add some Canadian images. Carlos brought a sculpture of Don Quixote, it is intricatly carved, about 2 feet high and 2 feet long and made from mahogany. More small sculptures by Gerard and some folded copper and silver forms by Stephen Turner. In the background is a graphite sketch by Robin Brierley of Claresholm. 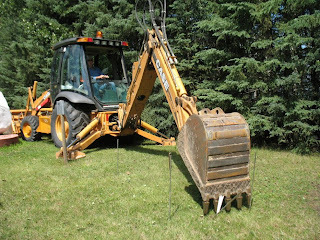 Vantigham's Backhoe Service from Olds provided a machine Friday after noon to do the groundwork nessecary to pour the bases for some of the sculptures. Three will use stone bases, they don't need concrete under them as they have a pretty big footprint. Looks like we will pour the bases on Monday, that will give the concrete 4 days to cure. 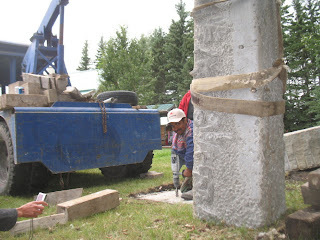 The Celtic cross and the temple will set a lot of wieght on a small area, the concrete will be reinforced with metal. The stone Gerard is using for "Desire To Be" is too large for the backhoe or Old Blue to move, so he is surfacing the bottom of it near the house where it sits now. 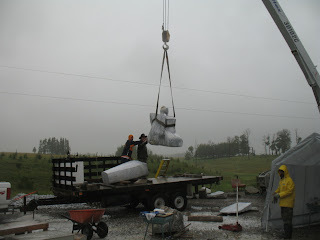 When the big crane comes we'll place it first and while the other sculptures are being installed he will prepare the top surface. 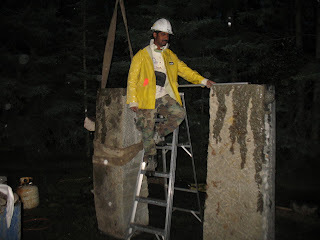 While we were placing some of the base stone Chander took a break. We made it through the big storm earlier this week, it is really nice to see the sun and blue sky though. Stephen Turner from Calgary has spent a couple of weeks here. 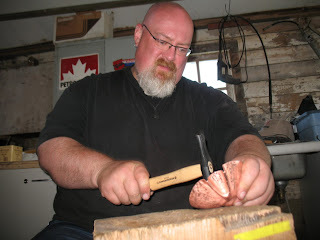 He is a sculptore and metalsmith, here he is working on a folded copper form. He's also been a big help on site when we need to get stuff done. 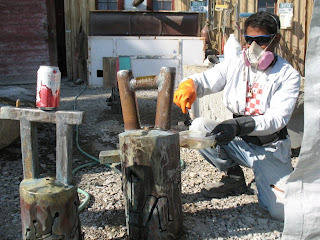 Chander applies patina to his bells, they will be beautifully rusted within a couple of days. Chander's bells after being welded, decorative designs cut out of and some welded to them and being treated to create patina. 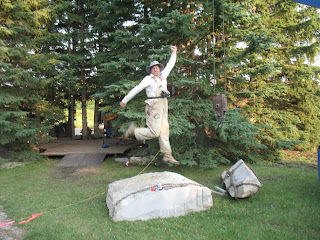 There are a couple of extras too, one in stone that weighs about 500lb which will hang in the trees somewhere. 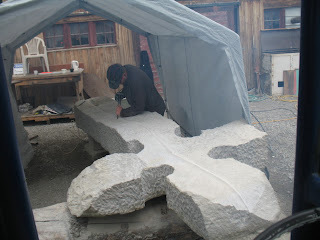 Paul is taking a pretty big slice off the back of his cross to prepare it for the feather, and all in small chunks! !